He is tiny and adorable and he needs some help now. Please SHARE for his life, he's SUCH a cutie and a FOSTER or ADOPTER would save him. Carson, a shelter notorious for its high kill rate, is not the place where hope abounds to say and write the least. Dogs at Carson are given just weeks, and sometimes even just days to find forever families before they are put down as a form of “population control” according to Carson. 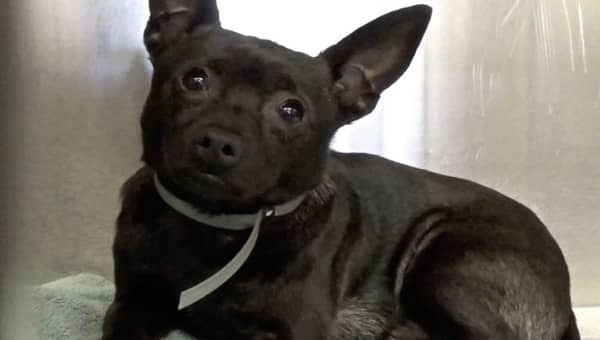 #A5161931 My name is ZORRO and I'm an approximately 1 year old male Chihuahua. I am not yet neutered. I have been at the Carson Animal Care Center since 3/27. I will be available on 3/31. You can visit me at my temporary home at C210. INTERESTED IN FOSTERING? If you're in LA, OC, San Bernadino or Riverside County and would like to apply to foster a Carson pup, please call the shelter to complete the foster application. 0 Response to "Zorro is the little black chi that nobody wants, 1 year old was given another day to find a home"